UL LISTED-one safe chandelier lighting.Sloped ceiling available and Adjustable Height. This Handmade 5-light chandelier is beautifully crafted in a industrial look. 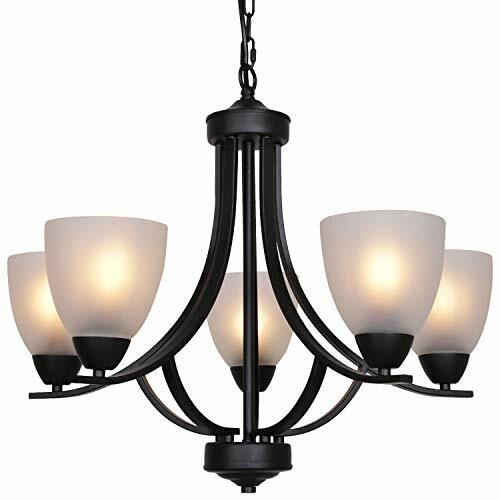 Its traditional design in black finish adds the perfect touch of elegance to your dining room,entryway or foyer. ❉Artistic Glass Shade: White unique glass shades Design that provide a elegance look with black finish,perfect for decoration of entryway, hallway, dining room, foyer, Kitchen, living room, meeting room etc. ❉Lighting Features: sloped ceiling available and fully dimmable when used with a dimmable bulb and compatible dimmer switch. ❉Dimentions: Chandelier: 24''(D)×72''(max-H) ; Glass shade: 5.12''(D)×4.72''(H); Canopy:5.12''(D), fully adjustable designer chain allows you to customize the fixture to your lighting needs and desired look. ❉Our Service:We providing free glass shade replacemnt for u, if your glass shade broken, you could click on LightingPlus and then click on "Ask a question" to contact us the original manufacture quickly, any quality and skill problems,we will help u soon, such as some replacemnt parts and more. ❉UL LISTED for safety: Designed with E26 bulb sockets that is compatible with any incandescent or LED bulbs(Bulbs Not Included).